Given the abdication of American leadership on the Iranian nuclear program for the last decade - both the Bush and Obama Administrations have failed - it appears that Iran will be successful in acquiring a nuclear weapons capability. “I stand with the many citizens - from the U.S. and around the world - who are concerned at the prospect of Iran acquiring nuclear weapons. Nuclear proliferation is a grave concern to international stability, and in the hands of the sponsors of terrorism is entirely unacceptable. “Iran with the bomb could spark an arms race in the Middle East, with Saudi Arabia, Egypt, and Syria joining in. Given the fault lines - between Sunni and Shi'a, Israelis and Palestinians, Persians and Arabs, Turks and Kurds, fundamentalists and moderates - that's the last thing we need. And it's the last thing Israel needs. "No President should take any option off the table, including force. But we have time: Iran is years away from having a bomb and a missile to deliver it. We need to use the time wisely." I would posit that "we" - that would be you and Barack Obama in this case - have not used the time wisely. In the more than three years since you made those statements, Iran has moved steadily towards its goal while all "we" have done is make idle threats of "crippling sanctions." Your Secretary of State's blatantly misleading claims about increased Russian and Chinese support notwithstanding, the sanctions "we" have been able to get through the United Nations Security Council have been ineffective in achieving the objectives. Life is tougher now for the average Iranian, sure, but "we" have not measurably slowed the Iranian nuclear program. One would have to conclude that despite the rhetoric of the American government, the United States has resigned itself to dealing with a nuclear-armed Iran. That will inevitably lead to a nuclear arms race in the Middle East. Iran should be thanking us. Israel may not so easily accept the existence of Iran with a nuclear arsenal. We'll forgo the discussion on Israel's not-so-secret nuclear weapons. It is a fact the Arabs have learned to live with - most have assessed that the probability of a first-use strike by Israel is too low to quantify. The Iranians? Given the urgency with which they are developing nuclear weapons and the missiles with which to deliver them, the mullahs have not made that same calculation. I cannot fathom what thought processes, if any, are going through the minds of the Iranian leadership as they rush towards a certain confrontation with the rest of the world. 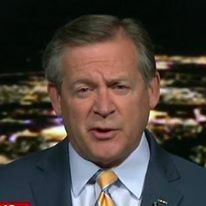 I believe they have correctly assessed that despite the "no options off the table" talk from Washington, there will be no American military action by this Administration and that they have a free hand to continue their efforts. The confrontation over the program, if there is one, will be with Israel. The United States believes it can deter a nuclear-armed Iran if necessary. Iran poses no missile threat - not yet, at least - to the contiguous United States. The missile track from Iran to CONUS is at least 5,000 nautical miles. While the Iranians may think they might prevail in a fight with its Arab neighbors or even on a good day, Israel, even President Mahmoud Ahmadinejad knows that a nuclear attack on the United States would almost certainly result in a "Biblical, Old Testament-level" response. The difference between the American and Israeli assessments of Iran is based on the probability that deterrence will work. The Israeli intelligence analysts with whom I have discussed this issue believe that Israel can successfully deter any of its Arab neighbors from using any type of weapon of mass destruction against the Jewish state, knowing that Israel possesses what we called in the military, a "strategic capability" - military/diplo-speak for "nuclear weapons." Whether or not Israel will tolerate Iran's acquisition of a deliverable nuclear weapons capability is still questionable. We know the Israelis have developed and exercised plans to attack Iran's nuclear facilities. At some point they may want to execute one of those options. However, the likelihood of a successful attack on Iran is not great. It is a long way to the targets - virtually all of it in hostile airspace, which precludes many aerial refueling options, thus the aircraft will be operating at the extreme limits of their combat radii and will be carrying more external fuel tanks and less munitions. It is a difficult military scenario. Will the Israelis try it? That depends on how they assess Iranian intentions once Tehran has nuclear warheads and missiles to carry them. If they believe the Iranians are apt to launch a first strike, the Israelis will attack. They will not wait to absorb the potential destruction of half of Israel's population. While Israel's reaction is uncertain, the same cannot be said for the other power brokers in the region. If the Iranians acquire nuclear weapons, it will ignite an arms race in the region. At a minimum, Saudi Arabia, Egypt (as it recovers from the revolution) and Turkey will seek their own "strategic capabilities." The former director of Saudi Arabia's intelligence service stated this week that if Iran acquires nuclear weapons, then the Kingdom may be forced to as well. Although Prince Turki al-Faysal couched his remarks by first citing the world's failure to convince Israel to abandon its nuclear weapons, then casually adding "as well as Iran," his meaning was perfectly clear - if Iran develops them, we'll buy our own. Saudi Arabia is currently planning to build 16 nuclear reactors to generate electricity. The weapons program would be an easy add-on, although the Kingdom is a signatory to the Nuclear Non-Proliferation Treaty. Saudi interest in a nuclear weapons capability is not new. In 1987, the Saudis purchased CSS-2 missiles from China; the missiles are designed to carry a nuclear warhead. Although the Saudis did not acquire that capability, they did express interest in a joint research and development program with Pakistan. If the Saudis decide to move ahead with a nuclear weapons capability, they have the requisite infrastructure already in place. 9. (S/NF) COUNTERING IRAN: We expect that Saudi Arabia will continue to develop its ties with China, in part to counterbalance relations with the West. While the King's preference is to cooperate with the U.S., he has concluded that he needs to proceed with his own strategy to counter Iranian influence in the region, which includes rebuilding Riyadh-Cairo-Damascus coordination, supporting Palestinian reconciliation, supporting the Yemeni government, and expanding relations with non-traditional partners such as Russia, China, and India to create diplomatic and economic pressure on Iran that do not directly depend on U.S. help. The King told General Jones that if Iran succeeded in developing nuclear weapons, everyone in the region would do the same, including Saudi Arabia. Turkish leaders, watching what is happening in neighboring Iran, are involved in discussions on whether the country should begin a nuclear weapons program. While the ruling Adalet ve Kalkinma Partisi (Justice and Development Party, or AKP) has attempted to bridge the gap between Iran and the West, Iran does not seem to be interested in a compromise. A Turkish-brokered deal failed last year. A nuclear-armed Iran would challenge Turkey for dominance in Central Asia at a time when the nation is seeking to re-assert itself as the leader of all the Turkic peoples. There has been a low-level nuclear program in the country for years, including some cooperation with Pakistan. If Turkey is to acquire a nuclear weapons capability, the AKP will have to give the word and allocate the requisite resources. Turkey's economy is doing remarkably well compared to the rest of Europe, so investing money in an expensive research and development program will meet resistance. When Iran presents the world with a nuclear weapon, the Turks will overcome that resistance and embark on their own program. Egypt is the leader of the Arab world. If the Iranians successfully acquire a nuclear weapons capability, Egypt will assess that as a direct threat to the Arab World. While Saudi Arabia views Iran as a rival in the Persian Gulf, Egypt views Iran in the larger context of the entire Arab World. 3. (C) Asked about Egypt's reaction if Iran developed nuclear weapons capability, Mubarak said that none will accept a nuclear Iran, "we are all terrified." Mubarak said that when he spoke with former Iranian President Khatami he told him to tell current President Ahmedinejad "not to provoke the Americans" on the nuclear issue so that the U.S. is not forced to strike. Mubarak said that Egypt might be forced to begin its own nuclear weapons program if Iran succeeds in those efforts. There is a new government in formation in Cairo. What the new government will be, let alone their policy toward Iran and its nuclear weapons program, is undetermined. I suspect even a Muslim Brotherhood-dominated government will want to seek an antidote to the poison of a nuclear-armed Shi'a Islamist power in the Persian Gulf. The regime of Syrian President Bashar al-Asad has its hands full merely maintaining itself in power. Its first serious attempt to acquire nuclear weapons was destroyed by the Israeli Air Force in 2007 when they attacked a North Korean-provided reactor northwest of Day az-Zawr. If the regime survives, they will likely revive their quest for nuclear weapons, but this is not in reaction to the Iranian nuclear program. Iran and Syria are allies; they are signatories of a mutual defense treaty. A Syrian weapon will be in reaction to Israel's nuclear capabilities. If the Syrian regime survives and decides to pursue a nuclear weapons program, it is a virtual certainty that Israel will attack it. An Iranian nuclear weapons capability will trigger research and development programs in several countries in the region. 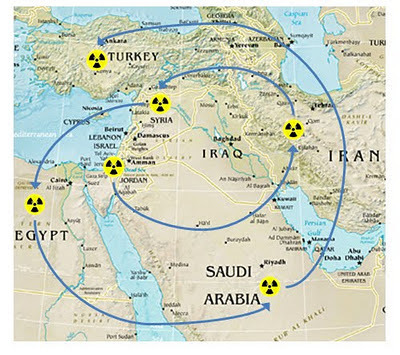 Iran cannot be trusted as a steward of these weapons - several Arab states and the Turks do not trust the mullahs in Tehran and will seek the ultimate deterrent, nuclear weapons of their own. Iranian Navy versus the U.S. Fifth Fleet?